FILE PHOTO: International passengers arrive at Washington Dulles International Airport after the U.S. Supreme Court granted parts of the Trump administration's emergency request to put its travel ban into effect later in the week pending further judicial review, in Dulles, Virginia, U.S., June 26, 2017. Data provided by U.S. Citizenship and Immigration Services shows that between Jan. 1 and Aug. 31, the agency issued 85,000 challenges, or “requests for evidence” (RFEs), to H-1B visa petitions - a 45 percent increase over the same period last year. The total number of H-1B petitions rose by less than 3 percent in the same period. The trend is likely to cheer supporters of Trump’s hardline stance on immigration. They say visas for skilled foreigners undercut American workers by replacing them with low-paid employees shipped in from abroad. But major tech companies, universities and hospitals contend the visas allow them to fill highly specialized jobs for which there are sometimes few qualified Americans. To be sure, the Obama administration also issued a large number of H-1B challenges – nearly 59,000 - from January through August 2016, and a similar number in 2015. 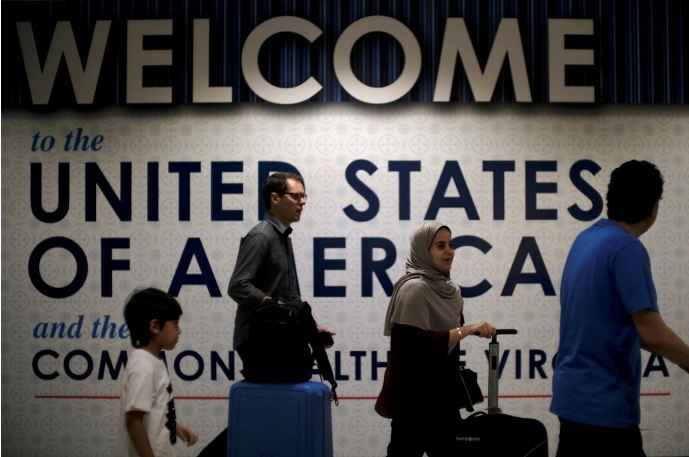 “One way to have an immigration policy that’s consistent with the policy that’s been articulated by the Trump administration is to put more scrutiny on H-1B cases,” said Cyrus Mehta, a New York-based immigration attorney. Partners HealthCare is a healthcare system that includes Massachusetts General Hospital and Brigham and Women’s Hospital, two prestigious teaching hospitals for Harvard Medical School. It has received more than 50 RFEs from USCIS so far this year, compared to fewer than 15 all of last year in response to a similar number of H-1B petitions, said Anthony Pawelski, an immigration attorney who handles H-1B applications for Partners. USCIS questioned the hospitals’ connection to the university even though their applications included proof of their non-profit status, a 1948 agreement between Harvard Medical School and the hospitals and even text from the hospitals’ website referencing a 200-year history with the university, Pawelski said. “They’re doing anything they can to delay the processing and adjudications and in their mind close any perceived loopholes,” he said. Both Democratic and Republican lawmakers have criticized H-1B visas, because the biggest beneficiaries are outsourcing firms, which critics say use the program to fill lower-level information technology jobs and replace American workers. Members of both parties have introduced legislation this year to reform the visa’s use. In an April executive order, Trump directed a review of the H1-B program, aimed at ensuring the visas “are awarded to the most-skilled or highest-paid” applicants. The order itself did not implement changes but directed agencies to suggest reforms. “What the Trump administration has done for the first time in a very long time is take seriously the fact that companies are misusing the H-1B system,” said Russell Harrison, director of government relations at IEEE-USA, the American branch of the Institute of Electrical and Electronics Engineers. Many of the government challenges for visas for entry-level jobs either say that the salary should be higher because the job is too complex or that the job does not count as a “specialty” occupation, as required by the H-1B program, according to a review of hundreds of RFEs by the American Immigration Lawyers Association provided to Reuters. Entry-level jobs are positions for fresh university graduates with little or no work experience. Such jobs can pay “Level 1” wages, the lowest of four tiers. “An RFE may be justified if the wage level is not appropriate for the position,” said Langston, the USCIS spokesman. Jeffrey Gorsky, an attorney with Berry Appelman & Leiden LLP, one of the largest corporate immigration firms in the country, said one of the firm’s clients, a mid-sized tech company, was hit with six RFEs from USCIS in a single day this year. The Trump administration is making it more difficult for skilled foreigners to work in the United States, challenging visa applications more often than at nearly any point in the Obama era, according to data reviewed by Reuters.